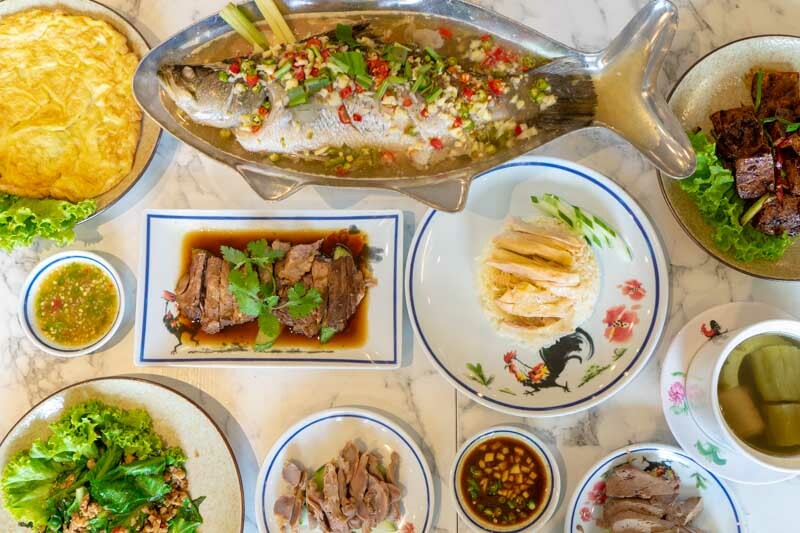 When it comes to Hainanese chicken rice, I’m always looking out for three things: tender chicken slices, fragrant rice and a spicy punch from the chilli. 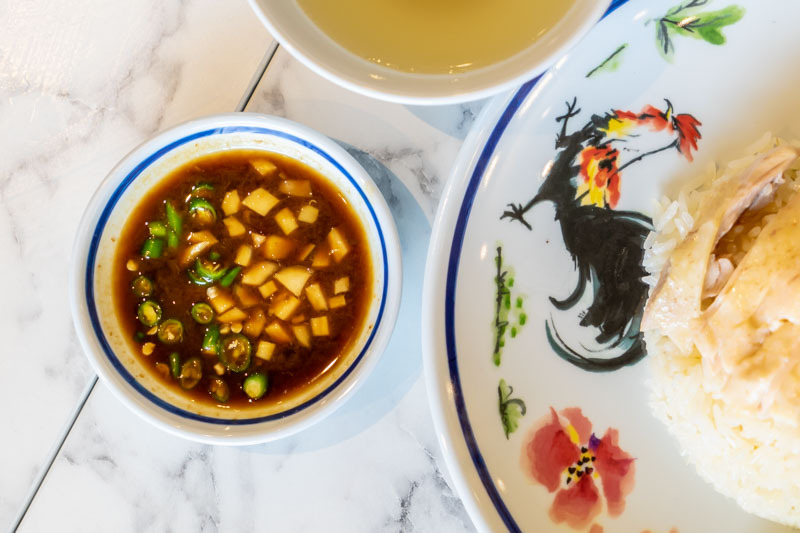 If you’re a chicken rice lover, then you’ll need to try Bangkok’s Go-Ang Pratunam Chicken Rice. But you don’t need to travel all the way to Bangkok, now that they’ve opened their very first outlet in Singapore at NEX, Serangoon. Since they have been awarded the Michelin Bib Gourmand, I was excited to try what they have to offer. 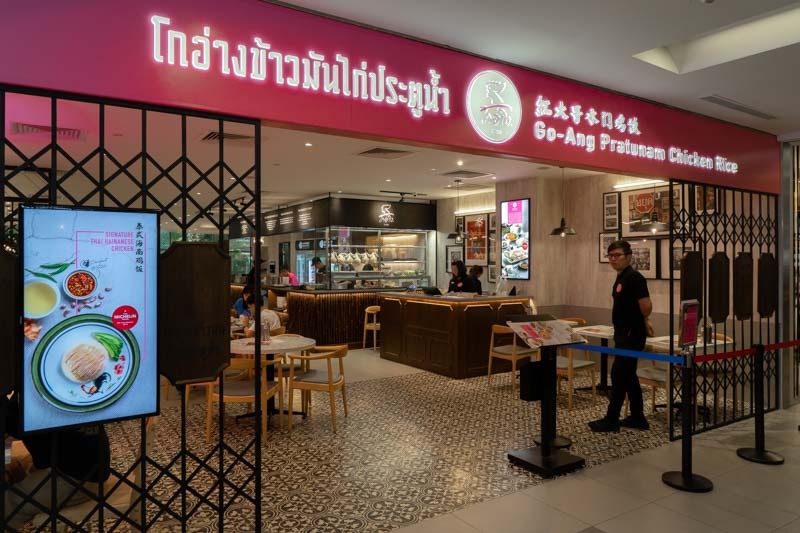 Apart from their intricately prepared chicken rice, Go-Ang Pratunam Chicken Rice has curated a range of new dishes just for their Singapore outlet. Of course, the first dish I had to try was their Signature Thai Hainanese Chicken Rice (S$5.50++ /single portion with thigh). The plate came with tenderly poached chicken thigh resting on a bed of fragrant chicken rice and slices of cucumber. I caught a whiff of a sweet aroma of the meat even before tasting it. Each delicate slice of chicken glistened with oil, and I was pleased with how tender and fragrant the meat was. The subtle piquant flavour from the ginger from the meat made it easily palatable. But what surprised me was their choice of chilli. 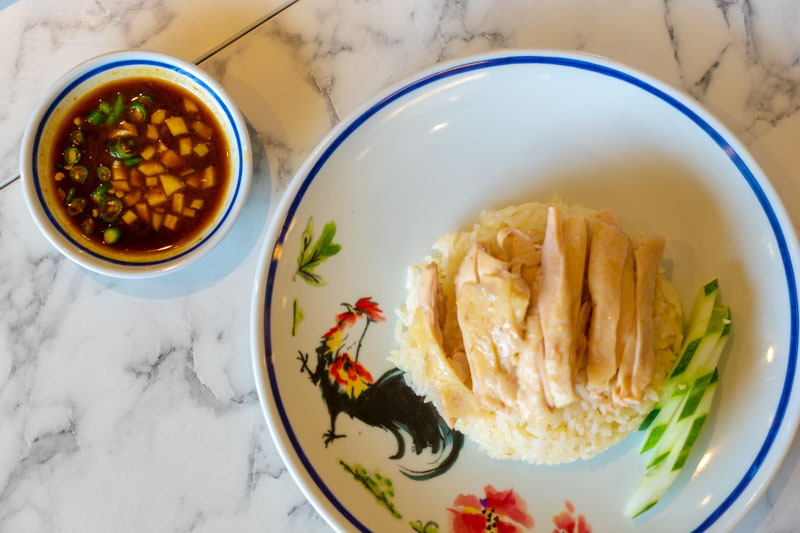 Unlike other Hainanese chicken rice that comes with a blend of red chilli and ginger, Go-Ang Pratunam Chicken Rice serves a secret recipe sauce created to go with their Thai-style chicken rice. The sauce consists mainly of fermented chilli, fermented bean paste and ginger chunks. Don’t underestimate the heat from this sauce; the green chilli padi packed a punch! The rice, on the other hand, wasn’t as fragrant as I would like and could use a little more savouriness. 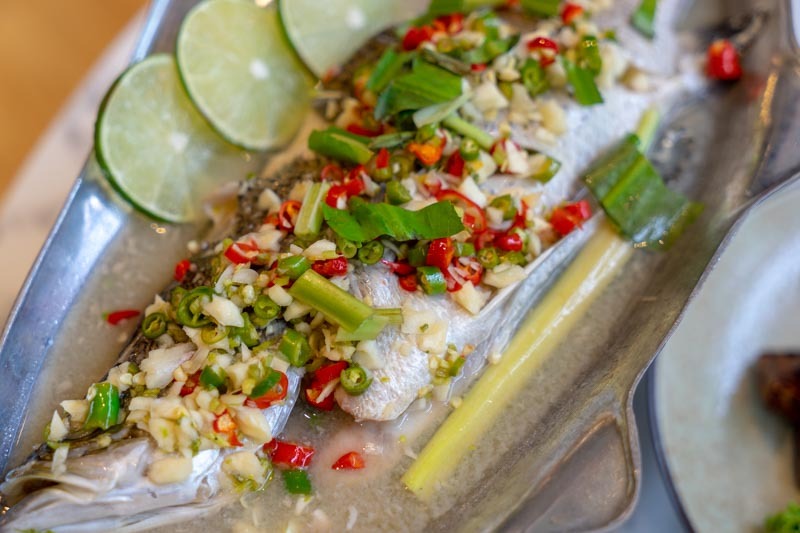 If you’re up for more than just chicken rice, the Steamed Sea Bass with Chilli, Lime & Garlic (S$28++) from Go-Ang Pratunam Chicken Rice is a must-try dish! The medley of garnish captured my attention leaving me wanting for more. Steamed to perfection with slices of lemongrass, the fish was fresh with an alluring sweetness that followed after. Nothing completes a meal like a fluffy fried omelette does, at least that’s what I believe. 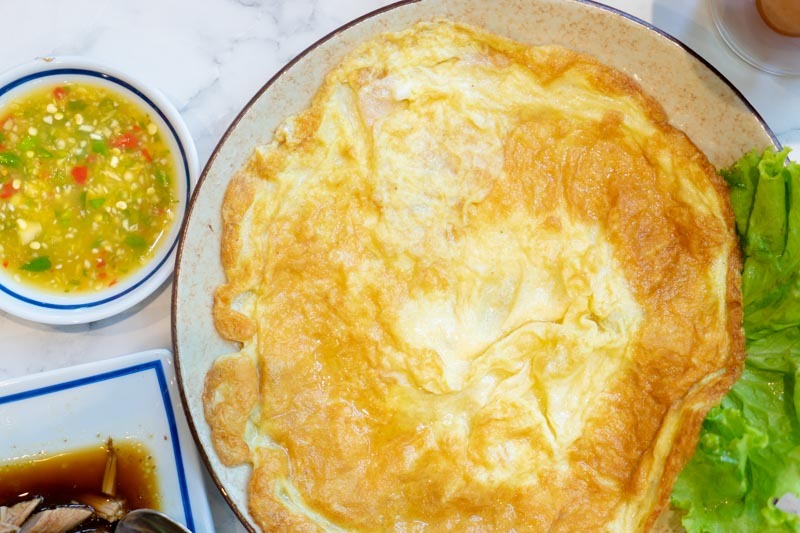 But this Chai Poh Omelette (S$6.50++) was nothing to rave about. We could barely taste the chye poh or even see it. However, the dipping sauce that accompanied the omelette was impressive enough to save this egg dish. Sweet, spicy and extremely tangy, the sauce hits all the right notes just like the authentic Thai chilli dip I had back in Bangkok. My second favourite dish was the Stir Fried Basil Chicken with Kai Lan ($8++), and it isn’t something you should pass on. 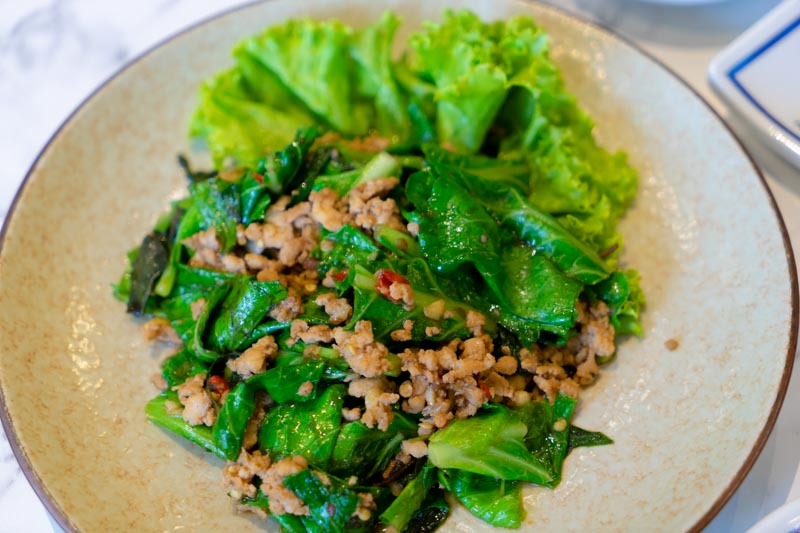 The Thai basil gave the leafy crunch a hint of earthy flavour and wasn’t too overpowering. Go-Ang Pratunam Chicken Rice did a great spin of combining kai lan and basil chicken together. 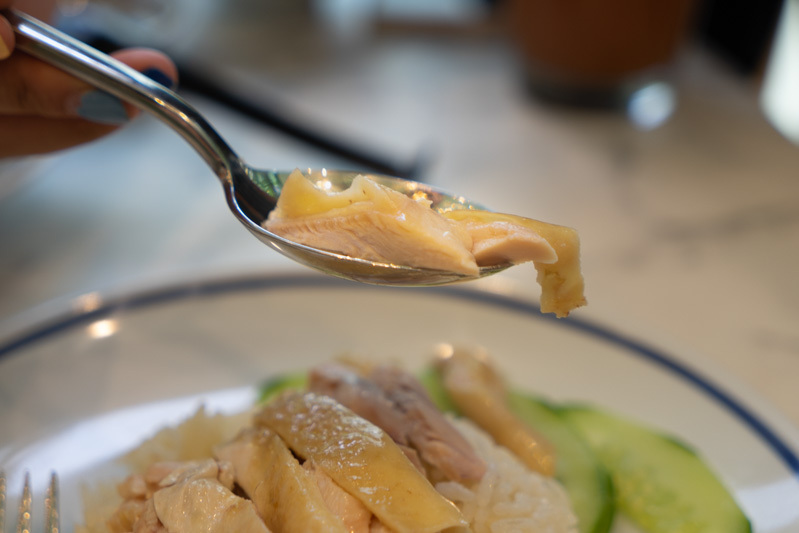 The basil and sweetness of the chicken complemented the otherwise bland kai lan. Go-Ang Pratunam Chicken Rice prepares their double-boiled soup daily. 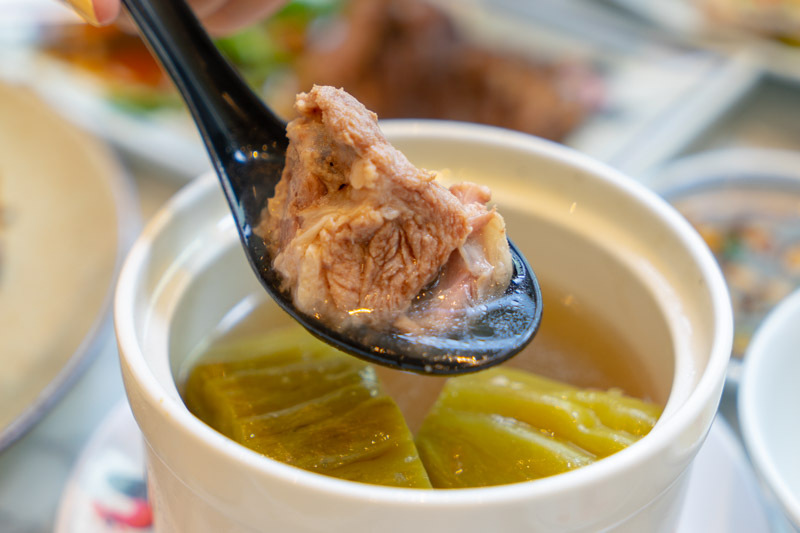 With three to choose from, we decided to try the Bitter Melon & Pork Rib Soup (S$6.50++). It may be nothing to write home about, but it left an impression on me. I used to have these soups as a kid from a little corner store near my home and having this was comforting. The soup tasted bitter at first, but after a few mouthfuls, the taste of the honey-like pork ribs slowly surfaced. The double-boiled soup was light and good for a post-meal cleanse. If you haven’t been to the shop in Bangkok, now here’s your chance to have it in Singapore. 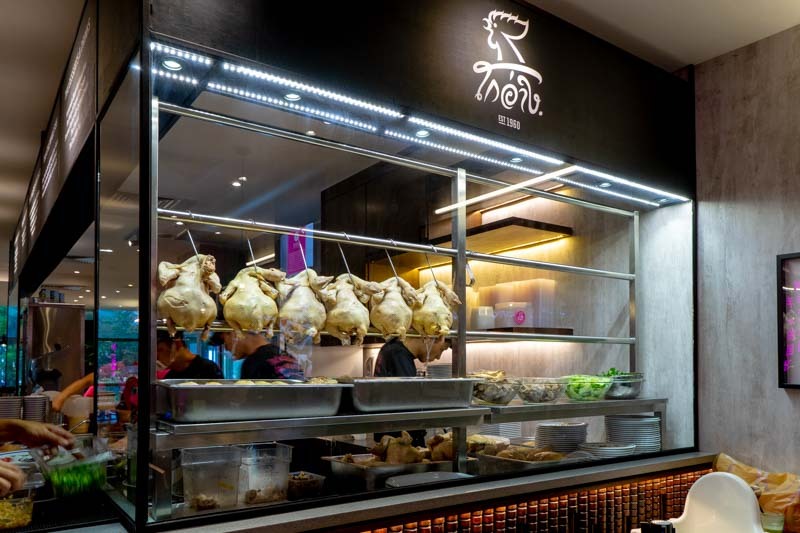 Though it’s slightly different from our local chicken rice, you have to head over at least once to try Go-Ang’s Signature Thai Hainanese Chicken Rice and their carefully selected dishes, which are only available here.